If you could take only one trip to the mountains of South Carolina, and you wanted to experience the Jocassee Gorges, learn more about the Cherokee Indians, and do it all in an hour or two, Keowee-Toxaway State Natural Area would be the place to go. Several years ago the State Park Service and the S.C. Department of Natural Resources designated Keowee-Toxaway State Natural Area as one of the gateway parks for the Jocassee Gorges. What that means is that when you visit Keowee-Toxaway State Natural Area you can get an introduction to the Jocassee Gorges without having to trek miles and miles back into the wilderness. Hiking along the Natural Bridge Trail, or the much longer and more strenuous Raven Rock Trail, you will experience a representative sampling of the range and diversity of terrain, wild flora and fauna that occur in the Jocassee Gorges. Either before or after your hike, take the time to go back across Highway 11 to the Cherokee Interpretive Trail, which has four kiosks displaying artifacts from excavations in the Keowee Valley before it was inundated in 1968. These artifacts represent the bulk of the remains of the Cherokee principal village, Keowee, and the 1760s-era Fort Prince George, both of which were located within a few miles of the park. The wooden model of Fort Prince George in one kiosk is a one-of-a-kind reconstruction of the frontier fort, based on the extensive archaeological excavation. You should also check out the Cherokee interpretive displays in the main office building if you happen to visit during the limited hours of operation, 11:00 a.m. to noon and 4:00 to 5:00 p.m. each day. Keowee-Toxaway State Natural Area is easy to find. From anywhere in South Carolina, take the most direct route to Highway 11, the Cherokee Foothills Scenic Highway, and head for Lake Keowee. The park is located on Highway 11 at the intersection with SC Road 133. The park is approximately one mile east of the bridge where Highway 11 crosses Lake Keowee. Keowee-Toxaway is a fee area. You can pay the fee either at the "iron ranger" as you enter the parking lot for the trail or across the road at the main office. The fee is $2.00 for adults, $1.50 for S.C. seniors. There is no charge for children age 15 and younger. As you pull into the parking area for the Natural Bridge Trail, you may notice construction going on at The Meeting House, which is actually the old Holly Springs Baptist Church, moved to this site in the 1970s. This fine old building is in the process of being upgraded, renovated and retrofitted to eventually become a visitors center for the Jocassee Gorges. Long-range plans call for construction of a larger facility that would house both State Park Service and DNR personnel to provide more in-depth interpretive information, along with dioramas and displays illustrating both the natural and cultural heritage of the Jocassee Gorges region. Step one before you begin the hike is to get out of the car, take a deep breath and relax. The Natural Bridge Trail is an easy 1.5-mile walk, so you don't need to go busting off down the trail. Take a few minutes to check out the map at the trailhead sign board, immerse yourself in the surroundings, and pledge to slow down and take the time to pay attention to what is going on all around you. Spring is a wonderful time of year to be in the woods in the Carolina mountains. The early wildflowers are peaking, and songbirds are flitting about gathering food to rear their next generation. Deer, turkeys and bears are active this time of year. So stay alert and get ready to experience the world at two miles an hour. One of the most attractive features of the Natural Bridge Trail is that it forms a loop. In forty-five minutes, or an hour if you lollygag, you will end up back where you started, so there is no backtracking. The first section of the trail is very typical of some of the high and dry ridges in the heart of the Jocassee Gorges property, mostly mixed pines and oaks. Blackjack oak, easily recognized by its waxy round-lobed leaves, may seem out of place up here in the mountains (it is more commonly associated with the midlands and piedmont), but there is one growing right near the trailhead and others scattered about. For the next quarter-mile or so, the trail will stay up on a pretty level stretch along the top and south face of a ridge. It is mostly dominated by both Northern and Southern red oak, white oak, sparkleberry and, perhaps the most common shrub in the Carolina mountains, mountain laurel, or ivy, as it is known locally. After the first 200 yards, notice the ivy thicket on the left slope. Notice also that very little else grows under its dense canopy. Ivy secretes a toxin from its roots that inhibits most herbaceous plants. 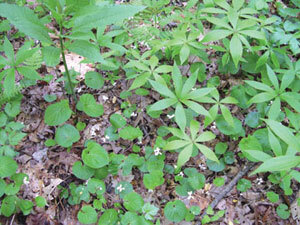 On the trail edges, however, you will begin to see little clumps and clusters of galax and trailing arbutus. These will become even more prevalent as you progress along the trail. When you encounter an intersection in the trail, take the right fork at the white oak with the triangular "Natural Bridge Trail" sign. Keep in mind that for the first part of the hike the Natural Bridge Trail and the Raven Rock Trail are one and the same. They will split up later on. Meanwhile, notice how the woods have become more open and the herbaceous layer (the wildflowers) has become more abundant. Look for the wildflower called spotted wintergreen - rat vein or rat's bane, as it is variously known in the mountains of both Carolinas. This little plant, only two or three inches tall, features paired dark-green leaves mottled with streaks of white. In May and June it has two waxy white flowers dangling from thin arching stems. In times past this was an important medicinal herb for the Cherokees and for other mountain folk, too. It was a popular remedy for everything from skin diseases to killing rats. Also pay attention to the bamboo-looking plant growing all along the sides of the trail. This is Southern canebrake cane, a very important plant to the Cherokees and the prehistoric Native Americans who came before them. From this plant, they fashioned furniture, mats, fish baskets, arrows, blowgun darts and a host of other tools. This is the same plant that in pre-Colombian times formed extensive "canebrakes" along the rivers and streams of the Southeast, home to black bears, Bachman's warblers and the now-extinct Carolina parakeet. Proceed on to the point at which the entire width of the trail is solid rock. This is the Natural Bridge. 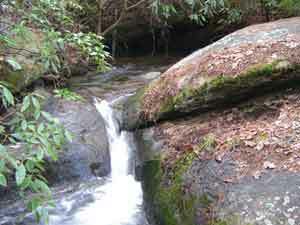 Look to the right and you will see Poe Creek flowing under the rock, a phenomenal sight. Evidently the water could not cut its way around the rock, so it just eroded a tunnel under the great boulder. While you are checking out the Natural Bridge, you might want to explore the rock shelter across the creek. It is large enough to have been occupied by the Cherokees as overnight lodging while hunting in the area. Continuing past the Natural Bridge, you will soon encounter the point where the Raven Rock Trail turns off to the right. Stay straight, descend a fairly steep section, and cross the creek at the point where the trail is closest to the stream. You are now at the half-way point of this trip, on the home stretch back to the parking lot. The remainder of the trail follows Poe Creek on the north slope of the ridge and then turns back upslope toward Highway 11. This section of the trail presents an entirely different environment - cooler, darker, and much more moist. Look for hepatica, partridgeberry (a.k.a. twin flower), both common and early blue violets, blue-stemmed goldenrod and several species of heart-leaf, also known locally as little pigs. After a fairly long, gradual ascent you will come back to the original trail intersection where you first veered to the right. This time turn right again and follow the path back to the parking lot. Don't forget to visit the Cherokee kiosks, if you have not already done so. 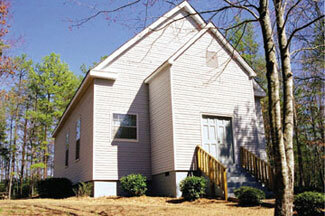 For more information, contact Keowee-Toxaway State Park, 108 Residence Drive, Sunset, SC 29685; (864) 868-2605.